Fish kept in a home aquarium can be susceptible to a variety of diseases and conditions. The appearance of red streaks or a red rash may be a sign of red pest disease or fin rot, according to the "Animal World" website, while patches that look similar to ulcers on a fish may be a sign of red pest or ichthyosporidium. Understanding these conditions is the first step in learning how to treat and prevent them from occurring in a home aquarium. Red pest disease causes red streaks to appear on the fins, body and tail of a fish, according to the "Aquarium Life" website. This disease is an internal infection that can range in severity from red streaks on the fish to tail and fin rotting. In very severe cases a fish’s tail and fin may fall off, according to the "Animal World" website. Some fish display red ulcers in more advanced cases of red pest disease. Due to the internal nature of the red pest disease it is often a very difficult disease to treat in an aquarium. Typically, fish with other health problems are more susceptible to developing red pest disease. Red pest disease often does not respond to external treatments, according to "Aquarium Life." Some recommended treatments include cleaning the aquarium and adding a fish disinfectant, dosing fish food with antibiotics and adding antibiotics directly to the water. "Aquarium World" website states that fin rot is another aquarium fish disease that may be characterized by red streaks appearing on the fish. 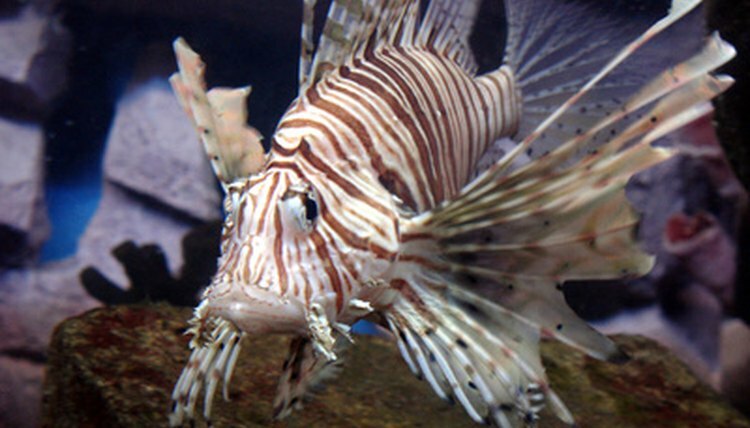 More often than not, fin rot is characterized by degrading fins with white spots, according to the "Pondenterprises" website. Fin rot may be caused by a bacterial or a fungal infection and may be caused by poor living conditions in the aquarium. Bulling and fin nipping by other fish may also contribute to fin rot, according to "Aquarium World" website. Some recommended treatments include cleaning the aquarium and adding a fish disinfectant, dosing fish food with antibiotics and adding antibiotics directly to the water. Fin rot may be treated by properly cleaning the tank or adding antibiotics to the water and food, according to "Aquarium World." Red ulcers and sores on a fish’s body may be a sign of the aquarium disease known as ichthyosporidium. Ichtyosporidium is an internal fungus that causes fish to become sluggish, lose balance and develop external sores and cysts, according to "Aquarium World" website. This disease is also contagious and may spread from an infected fish to a healthy fish in the same aquarium. Sadly, when sores begin to show on fish with ichthyosporidium, treatment is very rarely effective. Aquarium world recommends getting rid of the infected fish as quickly as possible to prevent the spread of the disease.